Last year at this time, we were abuzz with the heightened prospect that zebra mussel had been discovered in Prior Lake – way too close for comfort. The Minnesota Department of Natural Resources indicated they were beefing up their prevention and enforcement efforts. The Lake Minnetonka Conservation District made increased inspections their ‘top priority.’ The Lake Minnetonka Association agreed to make a $10,000 match available to support these increased inspections. The LMCD directed its Aquatic Invasive Species (AIS) Task Force to develop a comprehensive prevention plan for implementation in 2010. So, as we approach the open water season this year, where do we stand? The DNR issued less than 100 aquatic invasive species-related citations state-wide in all of 2009. A channel 9 investigative report last summer noted that ‘boat after boat’ left zebra mussel-infested Prior Lake without draining their bilge water as required by state law. The LMCD stated they were increasing the number of inspection hours in 2009 by 40% (LMCD Spring/Summer 2009 newsletter). The actual increase was 6% and there were less than 4,000 total hours of inspections in 2009. Part of the shortfall was due to the inability of the MN DNR inspector program to hire sufficient numbers of interns. As this has been a perennial issue, we would urge the LMCD to hire seasonal inspectors. And inspections and monitoring in 2010 will actually decrease. The MN DNR has notified the LMCD their grant will be less than last year (by about one third) and the hourly rate for the inspectors will be increased by about 20%, neither of which had been budgeted for by the LMCD. At their March 10th Board meeting, the LMCD approved an inspection plan for 2,700 hours of inspections – 24% less than last year! Video monitoring at accesses has been discontinued. In a larger context, the LMCD’s Strategic Plan Work Plan (2009-2014), has identified a goal of 18,942 inspection hours per season – seven times what was approved for 2010. I am aware of no plan or proposal to bridge this gap. The comprehensive AIS prevention plan, approved by the LMCD is nothing more than a list of prevention activities that the participating agencies and organizations had already planned and programmed in 2010, plus some other ‘proposed’ actions, but with no commitment to implement these. Perhaps most concerning is the submitted plan is far from comprehensive. The technical representatives on the committee could come to no consensus whatsoever regarding the relative risk of various AIS introduction pathways. Thus, the resultant plan is merely the collection of what agencies and organizations are already doing, rather than a comprehensive or focused strategy dealing with what needs to be done. We are going entirely the wrong direction. 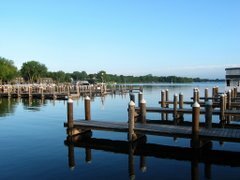 A year has gone by and Lake Minnetonka is less protected than last year. Our protection system for Lake Minnetonka is incomplete and seriously broken. The inspections, as noted above are vastly less than the stated need. Special events, events that bring participants (and their watercraft) from other states and who often frequent AIS-infested waters, are neither inspected nor washed, even though the LMCD found the voluntary affidavit system was not working and there was no use of the LMCD washers (Oct. 25, 2000 LMCD Board minutes) – this has gone on for 10 years with no change to the program! The prevention plan for 2010 calls for education of special event participants – which is a requirement of LMCD code anyway – again, no change. The Lake Minnetonka Association, speaking on behalf of lakeshore owners and businesses, expects the agencies charged with protecting Lake Minnetonka to be aggressively moving the ball forward for protecting Lake Minnetonka. Flowering rush, another invasive plant, was discovered on Lake Minnetonka last summer. This plant has the potential to circle the entire shoreline of Lake Minnetonka and there are no plans to contain its spread. Let’s not let zebra mussels (or spiny wateflea or hydrilla or VHS, or …) get into Lake Minnetonka. The AIS protection ball has lost ground – and we will be penalized for delay of game. Making money on the internet is easy in the undercover world of [URL=http://www.www.blackhatmoneymaker.com]blackhat team[/URL], It's not a big surprise if you haven’t heard of it before. Blackhat marketing uses little-known or little-understood avenues to generate an income online.